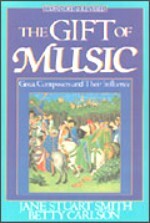 Recommended by Francis Schaeffer as "a wealth of detail concerning classical music." It really enhances your understanding of the composers and their music. an article about Shakespeares influence on the great composers, and Christmas Carols. The result is a remarkable and inspiring book, showing the importance of Christian faith for many composers, and the effect of this upon their music. But it also shows how the lack of faith has brought profound change in the meaning and form of contemporary music. Thus A Gift of Music seeks to open up a whole new world of music--to encourage listening to the finest compositions with new understanding and pleasure, and to stretch our ears and imaginations. It is a book which will be greatly appreciated by those who already love classical music, and by others who want to explore this delightful world for the first time.